The right tires in good condition can help keep rough weather from putting a damper on your travels. (NAPSI)—Safety on the road is important all year round, but winter weather calls for extra caution behind the wheel to keep you and your passengers safe. That’s why many auto safety experts including Discount Tire, the world’s largest tire and wheel retailer, urge motorists to keep road safety top of mind this winter and switch to tires specifically designed for cold weather driving. 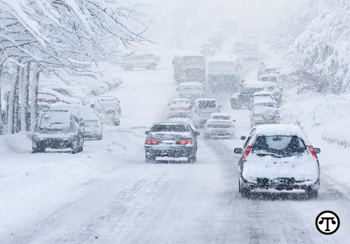 Winter tires are designed for driving in temperatures of 45 degrees or below. If there’s any chance you’ll encounter snow, ice, slush, black ice or wet roads on a consistent basis, you should prepare your car for these conditions. Often, drivers aren’t aware that commonly used all-season tires have a rubber compound that gradually hardens when temperatures dip below 45 degrees. When this happens, braking and turning are compromised as there is decreased road traction and less grip. It’s also important to note that snow and ice often pile up in the tire grooves and tread blocks on all-season tires, which can impact your vehicle’s performance. Winter tires are made with higher-silica compounds. This allows the tire to deliver much better traction, which reduces skidding and improves braking. In fact, in temperatures below 45 degrees, winter tires can provide 25 to 50 percent more traction than all-season tires. In addition, the tread block design includes thousands of very small interlocking slits—known as sipes—to provide extra road-biting edges for improved winter traction. 1. Replace your all-season tires with winter tires for driving in temperatures of 45 degrees or below. Make sure to replace all four tires with winter tires to avoid an unsafe traction mismatch. 2. Don’t forget the wheels when switching to winter tires. Having a set of wheels specifically for your set of winter tires will save money in the long run. 3. Check tire inflation pressure regularly and don’t forget the spare. Underinflated or over-inflated tires may result in poor handling, uneven tread wear and poor fuel consumption. 4. Rotate your tires at least every 6,000 miles or earlier if irregular or uneven wear develops. 5. Make sure the tire shop that gets your tires ready for cold temperatures torques the lug nuts to the proper specifications for your vehicle. For more facts about winter tire safety or to find a Discount Tire store, visit www.discounttire.com.